The usage of a website pop up have become the inseparable part of any marketing campaign of a website. These are the ultimate tools that can boost the conversion of a website and provide more sales to the store. 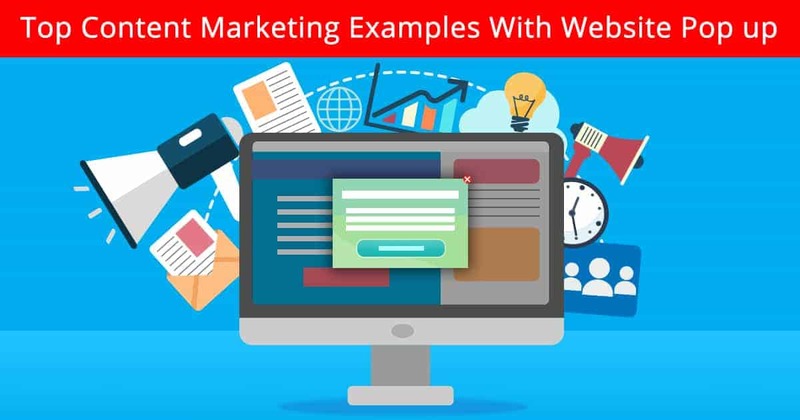 Dozens of various website pop up types are available in the market to implement on a site and raise the sales on the site. A correct and clever usage of a website pop up can greatly improve the statistics of the site. A greater part in this practice takes the selection of the best (specifically) website pop up tool suitable exactly for your needs and your site. Hundreds of website pop up services, popup maker plugins and applications are available in the market to choose from. One can easily find the best suit for a website, making a little research, comparing the ratings, pricing and the amount of features provided. Find a website pop up tool that works even with the cheapest hosting plans, as listed on DomainPromo.com. Let’s see what website pop up types can be the best uses to enforce better conversion on your site. What are the best converting uses and which popup types can promote your content marketing and convince your users the best? There’s no doubt that the Instagram has turn into one of the most dominant marketing tools of our days. Thousands of people make money, promote their business and become popular sharing their photos on Instagram. This is a complete advantage you can take to promote your website and promote more conversion. If you haven’t registered an account on Instagram yet, then go ahead – don’t miss a second! Start your business marketing today, on this social network. Share high quality images of your products/services and start collecting followers. 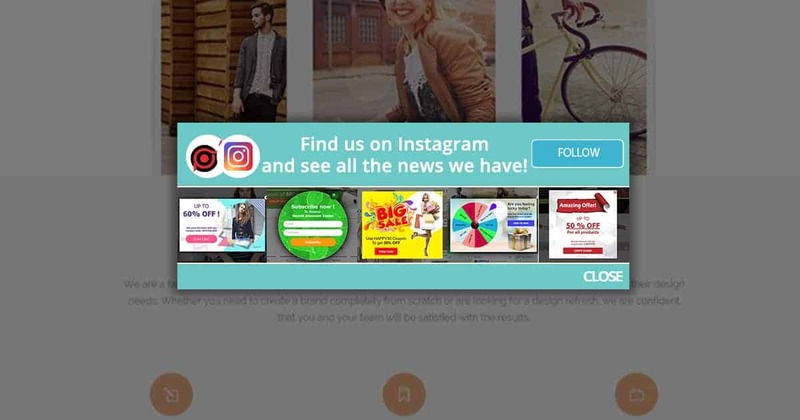 Create a simple social sharing website pop up, including an Instagram follow button and add it to your home page, i.e.. So, when a customer comes on your site, he’ll be notified about your Instagram shop and will easily be directed there. People are venturous by nature, and it’s easy to push them for shopping if you know how to deal with this fact. Sales and discounts are always a brilliant idea to promote more sales. Another point is to find the best way to display and offer those sales to attract more users. Ever heard about spinning website pop up tools? 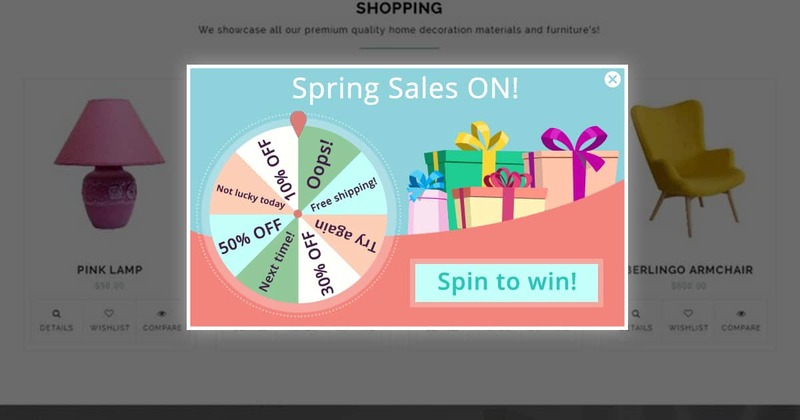 It’s something like a wheel of fortune, that displays the sales you offer on your site. The users spin the wheel and get the sales/gifts you offer in the wheel. Such kind of spinners are mostly used inside popups, and they aim to push the customers for more shopping. Simply construct your own spinner wheel, with your own offers and put it in a website pop up. The popup can be set to appear on exit intent, on your shop pages. So, if a user tries to leave the shop page without making a purchase, your offer may stop them. The probability of them to come back and shop on your store is really high. Hardly anyone can resist a sale offer, especially when it’s offered like a game. Newsletter emails are one of the best ways of content marketing nowadays. With a simple email letter, you can promote your service, inform about your sales and news. 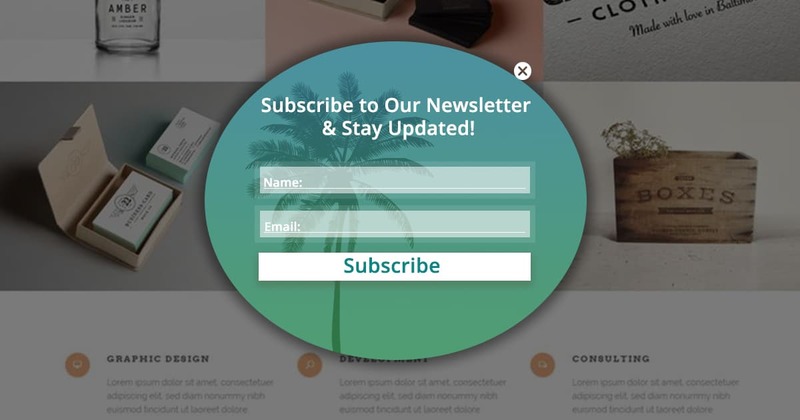 The most productive proven way to collect emails for the newsletter is a subscription form. And what can make it even productive – a website pop up, for sure! Create and design a clear subscription form with the minimal required fields and a “Subscribe” button. If your pop up tool has a lot of design customization options, you can make it as attractive as you can. Like, you can make a round form instead of the normal square one. This will definitely engage with your customers and they will be interested in it. After you have collected subscribers to your list, next step is sending them weekly (or monthly) newsletter updates, promoting your content and sharing your offers. This is a proven way to keep the acquaintance with your users. Among all the prominent content marketing means the website pop up usage is among the most effective ones. A clever and strategic usage of website pop ups can bring you more conversions in a short time period. Finding a perfect popup tool, that will fit your preferences the best, is one of the main tasks raising before you. It won’t take you much efforts to pick one. There are so many popup tools available in the market at the moment. The next step/task for you is choosing popup types to use on your. Get the best conversions to endorse your content and get more sales. Another important point is picking the correct triggering event, like exit intent, and the right pages to show the offer. This needs some targeting to show the offer to the auditory that will be interested in your offer the most. In the end, if you have built the connection with your users, it’s guaranteed that you’ll succeed in your content marketing. Next Post:Popup Maker Geo Targeting Option Released!